It’s all fun and games for kids coming to the BB&T Atlanta Open this weekend as the tournament is hosting a very special event for kids, SmashZone. The SmashZone joins the BB&T Atlanta Open featuring Andy Roddick, John Isner, Mardy Fish and a field of top ATP players from all over the world. SmashZone is located in the south end of Atlantic Station and is a fun venue that gives kids an opportunity to try tennis and play games on 10 and Under Tennis courts. Under the shade of inflatable arches, the smaller courts allow kids to hone their tennis skills with size appropriate racquets. SmashZone, the US Open's premiere fan experience is being used to promote health and fitness as well as introducing the sport of tennis to kids in a fun way. As part of the USTA’s ongoing youth participation initiative, 10 and Under Tennis, SmashZone includes a 53-foot trailer, which anchors four kid-sized tennis courts for youth play. The trailer features interactive activities for visitors including a Green Screen Cover Shoot and Super Mario Tennis games on 3DS game systems. With games such as Rally Courts and Target Challenge, SmashZone engages children in kid-friendly activities that are tennis related. 10 and Under Tennis is being promoted across the country by the USTA as a way to introduce kids to the sport of tennis by have them play real tennis on smaller 36’ and 60’ courts that are just their size. 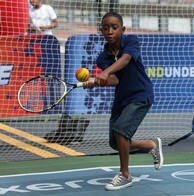 10 and Under Tennis is following in the footsteps of other youth sports such as baseball, soccer and basketball. Kids learn to play baseball by playing T-ball; they use smaller bats and larger balls. Kids play soccer on shorter fields, with smaller goals and smaller balls as well. In the gym, kids are shooting smaller basketballs on shorter courts. The Mobile SmashZone Tour hit the road earlier this summer on a 21 city tour, making at least six stops in Emirate Airlines US Open Series markets. It was created as an innovative “hands-on” opportunity for families to experience tennis and originated as a fan attraction at the US Open at Flushing Meadows. It was later taken on the road to fairs, festivals, air shows and now Atlanta, which welcomes the event back for the second consecutive year. SmashZone has attracted more than 750,000 people to its tennis courts. It has also had a lot of publicity, with athletes, entertainers and corporate endorsers trying tennis for the first time and touting its praise. The SmashZone Mobile Tour played an integral part of Nickelodeon’s Worldwide Day of Play in September 2011, where NBA superstar Chris Paul; Victoria Justice, star of Nickelodeon’s Victorious; Reverend Al Sharpton; and music producer and entertainer Percy “Master P” Miller along with his daughter, Cymphonique, star of Nickelodeon’s series How to Rock, stopped by to hit tennis balls with children and to help them lead a healthier, more positive lifestyle through physical activity. In addition, the SmashZone Mobile Tour has made a positive impact on local communities and served as a philanthropic event. The Smashzone was in Joplin, MO to provide much needed relief to kids and families after it was severely hit by a tornado in the summer of 2011. In addition to the $50,000 cash donation made to help rebuild Joplin schools, the USTA provided tennis equipment to local tennis associations to help them rebuild their tennis programs. It provided an outlet and helped boost the spirits of children and families affected by the disaster.